Howdy! I've been planning our den redesign for my sweet hubby and one of the things he really wanted was a unique shelving unit to display some of his vintage collections. 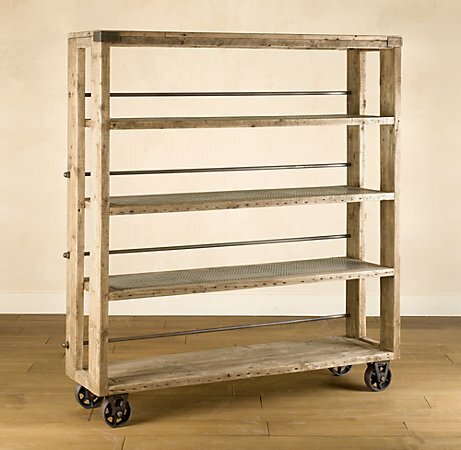 I've had my eye on this salvaged wood shelving piece at Restoration Hardware for quite some time now and thought it would be the perfect piece to showcase the things that make him happy. The small planks in the photo are the lip that I attached to the front of each shelf to create the illusion of a thicker plank and provide a nice finish. For the steel rods like in the inspiration photo, I used 1/2 inch wood dowels that I spray painted oil rubbed bronze. I bought corner brackets at the hardware store and spray painted those as well, to create the same detail as the Restoration Hardware piece. The castors had a good bit of surface rust, so I sanded that off with steel wool. Hardware is all ready! It's not exactly like the other piece but I'm pretty proud of it and my hubby LOVES it. THAT makes me so happy. So, that's it! I'm still picking up other things for the room here and there and can't wait to put everything together and surprise him! Stay tuned for that. I'm so excited to be doing this for him. And he is so excited that he's like a kid in a candy store! P.S. Almost forgot, total cost to build the shelf, about 10 bucks, for the cost of 4 wood dowel rods and 2 brackets. Everything else was either found or a supply we already had. Gotta love that!! Wow! I love it sooo much! It looks just like the one from RH. Where did you get the wood? Was it recycled? it looks like it! Great job, I'm so glad I'm following you! i LOVE it!!! i am going to fwd this post to my husband...he may have a new item on his "to do" list this weekend! great job! Diana you are so creative, this is great, looks like something you could purchase from Pottery Barn. You make it look so easy! Looks great..I think its a dead on for the real deal! Way to go! I love that shelf! I like the whole industrial feel, and the price couldn't be much better! Well I LOVE it too!! You did a great job! It looks just like the RH piece. Look forward to seeing it all filled up! You are an amazing DYSer! The piece is gorgeous, but the best part is all the recycled components. I'm glad I found your blog to get me inspired. Great job! This looks great!!! I've been looking for a shelving unit for our apartment but had the same problem: too expensive. I love that this is inexpensive and looks JUST like the $2,000 one!!! Wow! It looks fantastic! Really nice DIY approach to make something that looks so similar to a $2,000 shelf! You should make more and sell them, LOL! Can't wait to see what you put on the shelves! That is beautiful! Where do you get all this amazing barn wood? I'm linking up to you on my blog for the display ledge w/ hooks. I'm loving mine, thanks for the inspiration. We were just looking at that shelf in the RH catalog thinking we could do that. Yours looks fabulous! Love it! I'm pretty sure we were separated at birth. That shelf is amazing. I'm excited to see what you have to put on it. Grrrrreat job! I love it!! PS Diana, what is the camera that you use for all your wonderful photos? It looks AMAZING! You've got skills! That is gorgeous!!! Goodness Diana! You are an amazing lady! thats pretty incredible. i love the narrower look too. the rh one is just way to big for this ol house. thanks for sharing, its really great. I don't even try to figure out your instructions, they are way over my head, I just go straight to the pictures and wipe the drool off my keyboard! I have a pile of wood from an old privacy fence in my backyard that I want to make into a rustic table with wheels but no way jose can I do that! I'm just going to use some of the pieces to make beach signs...wish you lived close enough I could donate that old wood. And oh yeah, your shelves turned out better than the RH ones. This is such a cool idea! I totally love it and am amazed that you braved this heat to make such an awesome piece... seriously its flippin hot out! It turned out amazing. What a wonderful idea. It's amazing! You are so talented. So glad I stumbled across your blog! Awesome Diana! I wish I had a 10th of your talents! Can't wait to get a tour of your house soon to see all the new/old tuff you've added. Looks beautiful! Brilliant! What a lovely gift for your husband, and a great addition to your stylish home. Your shelf looks great! I just found you through Beneath My Heart. I've been lost in your post for about 30 minutes now. A definite new follower. Your home is beautiful! I've admired that piece for quite some time now...love it that you made a replica!!! I'll be keeping my eyes out for casters and barn wood!! Hi, I'm visiting from Beneath My Heart. WOW, this is a fantastic take on the original! I love inventive, "I can make that" DIYers. Fantastic! I found your blog over at beneath my heart. I love love love everything you have created here! This shelf is my favorite! I got so inspired by this I decided to keep reading and I have read every single post on your blog. I just wanted to let you know that I think what you are doing is wonderful, and I can't wait to see more creations! Just found your site, love your DIY attitude! I am curious as to the thickness of the wood you used. Was it 1 or 2" thick? I have access to some great reclaimed boards and some cast iron balusters that I would like to integrate into a book case design. This is even better than the inspiration! I would rather have yours than theirs any day! You did a fantastic job! Found you through Pinterest and I'm your newest follower...so glad I found you! It is beautiful!! Awesome job! Love, love, LOVE! I don't even know you, but I'm so proud of you! What a fun project and I think it's even better than the original! Way to go! Looks amazing!! How did u attach everything together? I don't see any screws? Asking cause I'm totally gonna try & copy:) also could u give a quick run down of "how" you put it together? Like the order of assembly type deal? Please let me know the size of all your wood pieces. I would like to make one of these but need exact measurments. oops...forgot to mention..my email is bcc92207@yahoo.com...also love your decorating style! I love it! I've been following you for a little while now! You did an amazing job on it!! Would you send me the details of size and thickness of wood and how you put it together? I want to try and make my own bookshelf, and I came across your blog. I adore your masterpiece! Could you send me some specific dimensions and how you attached the wood together? I would like to build a version of this bookshelf. Could you explain how you attached the wood together? I love how the wood looks weathered, adding to it a beautifully rustic charm. You have given me some ideas for some storage shelves I’m thinking of making that would compliment really well with the general wooden theme of my house. The castor wheels are pure genius. The problem with big shelves is that once they are used for storage of whatever you want to put in them, they become this huge, imposing structure you cannot move. The wheels completely solve that problem. Howdy Our Vintage Home Love! 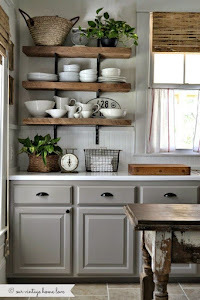 I love the reclaimed wood shelves in your kitchen! Have you blogged about it? Would love to hear more about the iron bracket used to support the wood planks. Where do you find such a neat and industrial ironwork? Thanks!